Rainfall has been scanty this year and Pune has been feeling the pinch, with water cuts prevalent across the city. However, in a proactive step, citizens living around the foothills of the Pashan hill have ensured that they, and residents of the general Baner and Pashan areas, have sufficient groundwater to meet their needs. Over the past three years, residents took the effort to build continuous contour trenches and check dams along the foothills, thus ensuring the conservation and percolation of water. Earlier, we relied on around six water tankers a day for 350 residents in our society. Now, over the past two years, our dependence on the tankers has reduced to zero,” said Dr Vijay Rahayakar, a resident of the area. Rahayakar emphasised that the water percolation initiative was entirely community-based and done manually without any assistance from machinery. 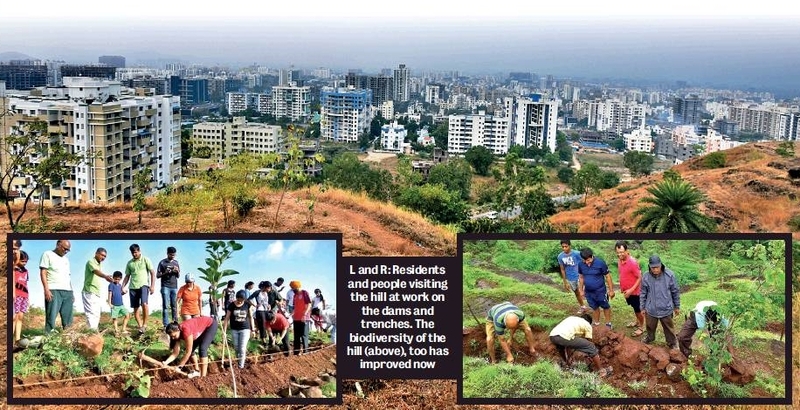 “Volunteers from the neighbourhood and regular visitors to the Pashan hill contributed to the effort. The result is that some residential complexes like us, which spent around Rs.60,000 a month on water tankers, no longer need to rely on them,” he added. Around 1,200 people have benefitted from these efforts taken over the last three years during which 20 check dams and trenches were built to store and percolate the water. “Regular visitors to the hill from four residential complexes claimed to have become independent of tankers even during summer,” enthused Sunil Shejal, a chartered accountant and another resident. Shejal added that the survival rate of the trees on the hill has also increased. “Tree plantation drives have been held on the hill every monsoon for the past ten years. The survival rate for these plantations used to be around 60 per cent. Since the CCT were set up and groundwater levels improved in the area, the survival rate has gone up to 100 per cent as the soil can hold the moisture, helping plants to sustain during dry periods. Pushkar Kulkarni, an investment consultant, has been visiting the hill for the past 12 years and is delighted to see the biodiversity improving. “The number of birds visiting and nesting in the area has increased. Animals such as rabbits and peacocks have always been here, but now their presence is more visible,” Kulkarni said. He added that while nearby areas may not have become totally free of tankers, they can certainly sustain for longer during peak summer months. “The tankers are usually required during March and April. 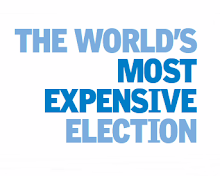 But some people have said that they can now sustain for two weeks longer. The aquifer (underlying layer of waterbearing rock) may vary across areas. This feedback certainly shows there is an increase in groundwater levels,” Kulkarni said. 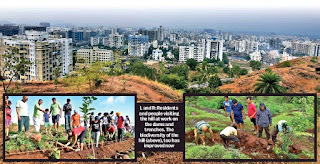 Dipak Shrote, a founding member of Vasundhara Swachata Abhiyan, an NGO that has been active in improving the green cover at the Pashan hill commended the initiative. “Our movement was started with locals and over a period, other NGOs, private entities, students, corporates and others have come forward to contribute, too. Citizens need to take more such initiatives, and those representing us should encourage such causes rather than politicising the water issue,” he said.